Well, Laura R. is in the hospital at GF. So I went there this morning. She's recovering from surgery very well. She was born in December 1925. And she is about as patient and gentle a person as I have found. After visiting Laura, I went to Crookston. I stopped at the grocery store, the court house (to check on a particular case that involves family who are members), and then the Hospital/Nursing Home to see Lyle and Muriel. They were doing pretty well. Muriel thinks this might, possibly, be her last day on pain meds. She still has to complete therapy and training in how to handle Lyle's physical needs before they can both go home. Pr. Preus happened to be at the Nursing home visiting some of his members when I stopped there. It was good to see him. I hope our families can get together sometime soon. Mayville seems so far away (actually, it is far away). But, I suppose, we are just as far away from them now. I got home in the early afternoon. About 175 miles. I spent a bit of time working on sermon prep. The VBS material came today, so I went through that. I also spent some time working on a translation of the Kirkelige Maanedstidende for 1859 (the old Norwegian Synod's version of the Sentinel). The article was "Uddrag af Forhandlingerne ved den fri evangelisk=lutherske Conferents i Fort=Wayne, Indiana fra 14de til 20de Juli 1859. (Oversat og indsendt af Jacob Aall [sit] Ottesen). Om den 14de Artikel af Augsb. Confession." It looks very interesting. By the way: Ligers are real. Sunday was pretty busy. After the three monring services I got home around 12:30. It was a quick meal and then off to Lengby, MN for our Circuit #8 lay conference. We hold a conference for the lay members of all our congregations each year. Sometimes we have a guest speaker. Sometimes the pastors present topics. This year we invited Pr. Jerome Gernander to present on Paul Gerhard's hyms. I was asked to present on Closed Communion. Pr. Gernander had a pastoral conflict and was unable to attend, but Pr. Stafford presented Pr. Gernander's paper in his place. I presented on the Biblical teaching of Closed Communion and the reasons which God gives in His Word for Closed Communion. After the conference we had a meal. St. Paul's, Lengby hosted this year. It was very enjoyable and very beneficial. We got home around 7:30pm. So, let's do a roundup on who's been reading this blog and my theological blog during the month of April. 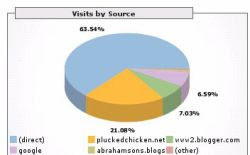 This month theabrahamsons has had 683 visits. 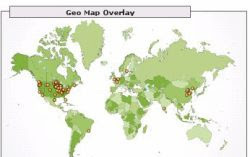 These visits came mostly from the U.S.A. but there were some also from other countries: Niteroi, Brazil; Stockholm, Sweeden; Den Haag, Netherlands; Paris, France; Lydiard Millicent, U.K.; Zhumadian, Linyi, Qingdao, Shijihazhuang, Hebei, Beijing, and Shenyang in China. 63% of our traffic has been directly requested by the readers. A full 90% is return traffic. Our second largest source of traffic comes from Pr. 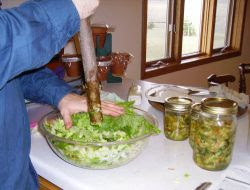 Jesse Jacobsen's blog titled the plucked chicken. I have had Pr. Jacobsen's blog listed in my side-bar for quite some time now. He approaches the issues in the ELS in such a gentle, simple, and charitable way. And his wit is several orders of magnitude greater than anyone else I have met. There are a couple of other sources through which people find out about this blog. My theological blog "diatheke" had 158 visits during April. Aside from the many readers in the continental U.S. we picked up a new reader from Fairbanks, Alaska. 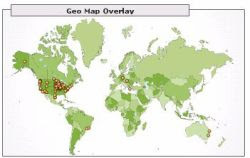 Foreign readers came from Rio de Janeiro, and Sao Paulo, Brazil; Erina and Mitchelton, Australia; Nikaia, Greece (a suburb of Athens); Budapest, Hungary; and Stadtwald, Germany (by Frankfurt). About 63% of the visitors were returning visitors. Most came to the page directly, meaning they have it bookmarked. Some got to it through the family/parish blog theabrahamsons.blogspot.com. Some came through redeemer-fortwayne.com. 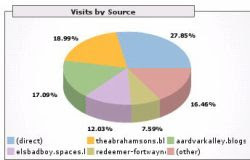 This happened, I think, because Redeemer, Ft. Wayne listed the blogs from Aardvarkalley. And, for some reason, Diatheke made the listings on Aardvark Alley. Aardvark Alley is a worthwhile blog that focuses on teaching the historical confessional Lutheran Liturgical practice. It is a useful blog for me. And, though I don't know the author, nor have I ever contacted him, it is very considerate for him to mention my theological blog. So, to the Aardvark, who calls himself "Orycteropus Afer" (Latin for "aardvark"), Thank you. Saturday night and the countryside is lined with fire. It's the spring burning. Most of the fires are controlled. A few are set by fire-bugs. This morning I had church at Mt. Olive and Confirmation class. Next week Tyler F. gets confirmed. Tasha will probably be ready by the end of May. There were fires all over the prairie. 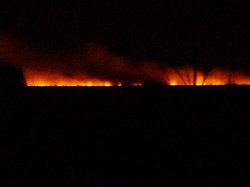 It reminded me of the prairie fire in the Laura Ingals-Wilder books. One of my members said that in 1957 there was a terrible fire that ran over a great deal of ground pushed by a 50mph wind. That same year a tornado devestated Fargo. I had a family call to go to today that took a deal of time. When I got home we raked the hay off the ground above the septic system and put it on the garden. All the kids were pretty much tuckered out by supper time. Of course, they got on each other's nerves during family time. But they all went to sleep pretty quickly. Man, am I glad for warmer weather, finally. Got to keep a bit of a watch these next few days for fire. We have some pretty dry CRP land right next to the yard. We'll have to keep the kids out of it until it greens up a bit. And, it's wood-tick season. My skin feels creepy and crawly just thinking about them. I had Mary pick up some pesticide. I hope to put that on the yard this coming week. Kudos to Jeremy for being selected as Student of the Month! Oklee Public School somehow picked him. I know he's bright and imaginitive. I can brag, but I'm his dad--not exactly what you would call an "objective" observer. So here we have Jeremy with Nitro and Matt, posing with his shiny award. This week went sooo fast. As any busy person knows, the more you do, the less you pay attention to the clock, or the calendar. What can I reconstruct of the week? Well, Tuesday I took as my day off, which meant work around the house and such. I did some cleaning in the garden and wore sweat pants most of the day. In the evening I did some prep for this coming week-end. I am to present a paper on Closed Communion this Sunday to our Circuit-wide Lay member meeting. I also did some sermon prep and Wed. School prep. Wednesday blew by in a flurry. A request has been made to me that I present a paper at a free conference the first week of June. The request was actually for a paper that I presented, in part, to some of the pastors of our Circuit and a few others. But that would mean some time finding the paper and tidying it up. I have a few days yet to answer the request. Well, I did sermon writing, Wed. School, and more sermon prep. Thursday I did a couple of calls and tried to finish up work on the May newsletter and calendar. I didn't get it done. It wasn't 'til Friday evening that I got the newsletter done. I found that I had run out of address labels for my printer. Friday I went to get labels and a swing for the swingset. There was only one swing left in Thief River Falls! Poor Alyssa, I completely forgot to leave her any info for the bulletin. While in TR I emailed her the info. I had to get tires replaced on the car. That reminds me, I can't remember for sure, but I think on Tues. I dropped off two lawnmowers to be repaired. The grass is growing. 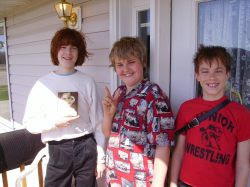 Jeremy got out of school early today and his friend, Nitro, came over to spend the night. 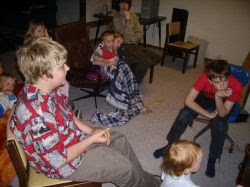 After devotion the kids all watched Raiders of the Lost Ark. I went over to finish memorizing and put labels on the newsletters. Hey, all you pastors! I bought a $30 some dollar MP3 player at K-Mart, on sale (1GB memory). It records voice that you can play back. I read my sermon into it and then played it back several times while I was working on the newsletter. I don't know if it would help you to do this, but it sure helps me clear up the way I speak a sermon and aids in quicker memorization for me too. Last night Lonny called saying that his mom, Betty was going to the emergency room. Maggie's mom is also in delicate condition down in Arizona, so she's away with her mom. (Lonny and Maggie are married, for those who don't know). Early this morning I went to the hosp in Bagley to see Betty. She has a great attitude, but she was very weak and congested again. Physical Therapy is working with her to see what limits she faces with her congestive heart failure. She may have to spend time convalescing in the nursing home. Please keep her and her family in your prayers. I made a brief stop at the Staffords to ask Pr. Stafford if he could look in on her this week. While I was there I found out that Pr. Stafford may have some injury to his knee from the car accident he was in during lent. It may be nothing, it may be serious. Please keep him in your prayers. 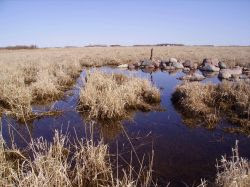 Then off to Crookston to see Muriel and Lyle. Shirley was there, and Muriel had just been discharged from the hospital to the nursing home. She's in the room next to Lyle. And being the good pastor I think I am, when I got to the hospital I realized that I had neglected to fill up my kit for shut-in communion. Sometimes there is a great big "L" on my forehead. Muriel is on a good pain med, they had to take a graft from her hip to fuse her vertebrae. So she will have quite a burning pain for a few days. I left as they were finishing up their noon meal. Then, off to the courthouse in Crookston. I have a member who's daughter-in-law is involved with a case that is fairly serious in nature and which will impact their family greatly. Unfortunately, the daughter-in-law has not been wise in this case. Though you don't know their names, please keep them in your prayers. It was a long, stifling day in court. I got home at supper time, had a few pastoral telephone calls. Komapsumnida to Laura D. for sending a jar of whey and a recipe home with my wife last week. I went and got some bokchoi (chinese cabbage). I had all the other ingredients--except the whey. I made kimchi today. That's basically spicy sauerkraut. Kimchi has as many recipes as there are families who make it. 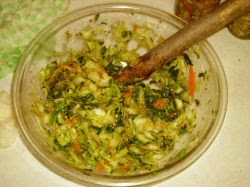 Mine uses carrot shavings, hot peppers, dried powdered shrimp, sea salt, ginger, chopped garlic, onion, bokchoi and whey. I didn't have the daikon radish. If you know where to get one in the TRF area please tell me. Whey? No way? Yes, whey! Why whey? 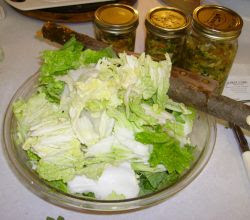 It has the right kind of bacteria to get the cabbage fermenting without too little or too much acidity. 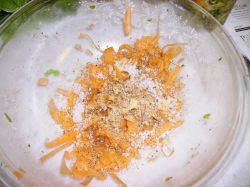 So we started above with the carrot shavings the peppers, the shrimp powder, the garlic, the ginger, and the salt. Here we top it with shredded onion and the bokchoi. How pathetic am I. Well, after having tasted a friend's mom's homemade, genuine, clay-pot in the back yard, garden grown vegetables, kimchee; it was pretty hard to please me for a while. But now, I crave Jo-San Kimchee at Wal-Mart. I even have spent $5 per pint on the stuff. Not very often, but the fact that I have done so shows how much I crave the good stuff, not merely Jo-San. Familiarity breeds contempt, absence makes the heart grow fonder. So you pound all these ingredients together (yes, for you more astute readers, that is, in fact, the end of one of the saplings I cut for a bow stave). After a while they get all pulpy and juicy. That's when you put the stuff in jars. Already it smells sooooo delicious. Fortunately, it doesn't wash out of the fingernails so easily, so one can enjoy the aroma for quite a while. When you have the mash it takes up probably about 1/3 the space all the original ingredients took up. I was worried that my 2 heads of bokchoi would take up too many canning jars. When you fill the jars you have to leave some expansion room for the fermentation process. The recipe the Laura D. gave to us recommended at least an inch from the top of the jar. 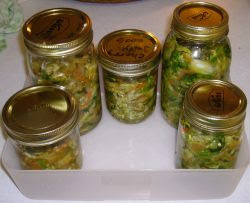 So, taking that inch into consideration, with 2 heads of bokchoi, and all the other ingredients, I filled 2 quart jars, and 3 pint jars with raw kimchi. Now we have to wait 3 days. Maybe we should make this a Good Friday to Easter Sunday tradition in the future. Notice the plastic pan to catch the overflow. It's three days warm ferment. Then after 3 days we are supposed to put it in the fridge. I'm going to try making German sauerkraut sometime soon. The video doesn't capture the cranes as they look. In fact it's almost impossible to see them. But for those of you who haven't heard this bird, take a listen. To get the effect near to what it is in reality, put both speakers beside you with your head in between. Then turn the volume up to 11. "That's one more..."
This morning at 5:20 one was just a couple hundred yards from the house. Of course, we had the window open on a nice night. When the crane went off I practically jumped out of bed. "Has he lost his mind?" I'm putting some photos that are kind-of late. The first is of the cow pond the girls like to play in and around. Last night at supper, in the middle of all the noise that a family of 10 can generate, one little voice chimed up. Johnny started singing a song. "I am Iron Man, ba-da, ba-da, ba-da, Iron Man"
We all burst out laughing. Some of the kids burst out into Bob Rivers' parody of the song; "I am Santa Clause." John is a three and a half year old motor-head. He sleeps with his cars and trucks, and now, aparently, he likes Heavy Metal. He's a lot like my brother was at that age. We'll see if he still likes both kinds of Metal later on in life. I just wish that my sockets and wrenches weren't scattered all over. But, he inherited that from me. My poor father. My brother, Jeremy, and I always made a mess of his workshop. 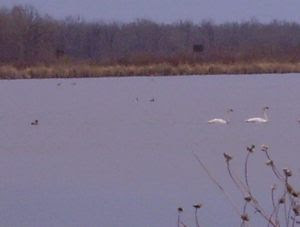 Second photo, swans. I'll try to get some better pics of the birds, but they are pretty skiddish. Here's a rather poor photo of two Sandhill Cranes on the left with a Canada Goose on the right. This was when Louisa offered to take my camera up close to the birds. Yesterday (Sat) after church we started to get some thunderstormy weather. I came out of the house and my hair stood up with static. I saw the girls, half-a-mile away by the cow pond. I could hear them plainly. There was a soft breeze blowing from their direction. But they couldn't hear me when I whistled, called, or honked the car horn. So I ran out to get them inside in case of lightning. 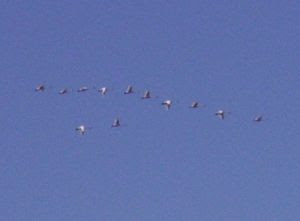 Frogs were singing like crazy, Cranes were hooting, Geese honking, and girls laughing and shouting at each other. Little girls are better conductors than dry grass. When I was about 2/3 of the way out they saw me. But they still couldn't hear me for the noise of the frogs, etc.. Finally they realized I wanted them to come back quickly. They gathered their stuff up and Louisa helped the smaller two. Elsie just ran. She didn't see the Sandhill crane until it rased up its wings in fighting position. I have to say, Elsie is smart, and a quick runner. She turned as quick as a jackrabbit and was off like lightning. Well, not lightning. That's what we were trying to avoid. They all got up to the house and it started raining. Today I stopped after church at one of the Wild-rice paddys. The paddy is full of waterfowel. They tend to take off when I stop to get a picture. Camera shy. But here's a few ducks and a couple of swans. Should I be worried that Johnny knows a song by a group named "Black Sabbath?" Nah. Hilda is still in the hospital, but they seem to have gotten the Pneumonia under control. It took a pretty big toll on her. Please keep her in your prayers. Muriel is still in the hospital, but is doing better now after surgery. Please also keep her in your prayers. Wednesday was pretty busy. Muriel has surgery today. I left for the hospital Crookston at 7:15am. Lyle is staying in the nursing home attached to the hospital for Muriel's surgery and recovery. She's having some work done on her back and is pretty optimistic about the surgery. Lyle thinks his bed in the nursing home is pretty rotten. I got back around 11am. Mary told me she got a call that that Hilda H. is in the hospital at TR and is in a bad way. Matt made me some really good eggs, sausage, toast, and coffee. Then I was off to TR. Hilda is in a bad way. She is getting out of ICU today, but she's got multiple problems. 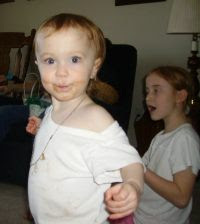 About 6 years ago she had surgery after which her lungs had refused to work. She's been able to relearn how to breathe, but she is very delicate. Norris, Marlene, and Mavis (her husband and daughters) were there with her when I got there. Any infection is a major infection for Hilda in her delicate state. Please keep her in your prayers. I stopped in to see Rod while I was there. Good news! He's going home today. He still has to meet with an Oncologist soon. And he still has some special care in healing from his surgery. But things are looking pretty good. I got home around 2pm, (200+ miles today) tried to talk with Mary and woke up at 3:05 in time to prepare for Wednesday School. WS went well. Louisa has had the original "Parent Trap" movie checked out of the library for a couple of weeks now and has been waiting for me to watch it with her. But even tonight there was too much to do, and we got done with family time and devotion at 9:30. Maybe tomorrow morning we can do that together. I'm over at the office tying up some loose ends (and writing this). Now it's time to sleep. Tuesday I took off. That, of course, didn't prevent me from receiving 6 pastoral telephone calls in the morning, which took up all the morning. 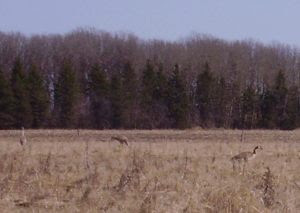 But in the afternoon I asked Elsie to take me out into the pasture where the girls play with the Sandhill Cranes. I wanted to get a good photo. I didn't get a good photo. I'll try soon to put a bit of video that might have a really good Sandhill Crane call. But no good photo. But it was good to be out in the wild, walking and stalking Cranes with Elsie. Later, Elsie came running into the house all winded. All the girls were out in the pasture, she ran barefoot for about 2/3 of a mile. "Come quick, dad. We got within 10 feet of the cranes and they're still there. So we went back out into the pasture next to a wooded area. The cranes were there, but they had become shy and were keeping too much distance for a good photo. Maybe the girls can get closer because they're shorter than the cranes. No matter. Louisa, Elsie, Clara, Sophie and I had a nice time stalking them and some Canada Geese. Louisa wanted to take the camera to get close to the geese. I opted for the "No" answer, mostly for fear of the camera. But what I told Louisa (and this is true, though to my shame, not the primary reason) geese can get mean if you sneak up on their nests, I didn't want her to get hurt. Then we walked around a bit, enjoying the creek and the small pond. The girls like to pretend it's their pond with their beech. I grilled potatoe's, steak, peppers and onions for supper. Yum! We had read-aloud with our kids before evening devotion. They all went to sleep fairly quickly. Mary parked our Astro in the driveway a month ago or so. It sat there until Saturday. The reason was that it wouldn't start. I'm supposed to be the "man" of the house so it falls on me to ensure that our transportation gets fixed, right? Well, TR is too far to tow for just a few $. So I did some research. After all, that's what all that college is supposed to teach me. We just finished paying off our (my) college loans this past year. What do I get for the investment? When I turned the key, I'd get a stutter the first time, then nothing but the iginition wheel turning the engine. There were expensive things (fuel pump), and cheap things (fuel pump relay) that could do this. So I opted for the cheap, picked up a Haynes guide for the Astro and a fuel pump relay for the 1995. Total cost $39. Saturday we had our first warm day. I replaced what the Haynes guide said was the fuel pump relay. Mama, now I am a man! I don't know how much of this can come through on this picture. The full size does a nice job, but that was too much to upload. Anyway, I got this Mon eve. 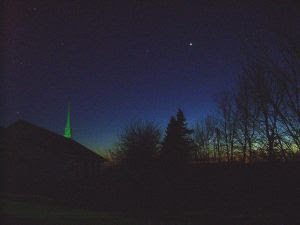 The bright spot in the sky in the upper right is Venus. Off to the left you should be able to see Orion's belt and head and shoulder. I only have a ViviCam 5386, not great for night shots. But I thought this shot was cool. This morning we picked up Pr. Stafford and went to Ulen for Winkel. I presented on Thesis 6 of Walther's Law and Gospel. We had a nice noon meal with Jenna's excellent salsa and all the food was wonderful. Then I went to Crookston to be with a family who have a daughter-in-law in Court. I got back to Ulen just after 4 and drove everyone home. It was kind of cool and rainy today. Probably not a good day to hold a global warming rally. Yes, I heard the terrible news about Virginia Tech. Let us all keep the survivors their families, and the families of the deceased in our prayers. First day of spring weather! 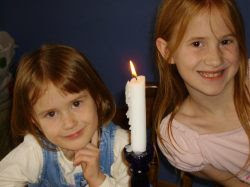 Sophie and Elsie wanted to pose by a candle. It turned out to be an OK photo. St. Petri had a dinner today so they also had late service. Early service was at Nazareth. Mary and the kids came up for the dinner, as did a couple of other families. A very nice time at St. Petri. I think I've probably mentioned this before, but Mt. Olive and St. Petri do not have running water. I'll maybe try to explain what an outhouse is to cityfolk some time, and the kind of fun kids somtimes choose to have with them, esp. on Halloween. There was plenty of fun outside on this day. After we got home, everyone was outside (except Jeremy, of course, he had to get his computer time. I cleaned out a flower pot and made the soil ready for planting. 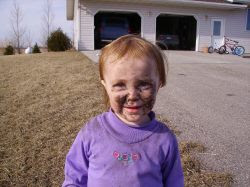 Stella decided to powder her face with the soil, and the deck, and the steps, and the landing. That's what brooms are for, I guess. Sunday eve we had a Youthgroup meeting at Oak Park. When the secretary sends me the minutes I'll put them on the Youthgroup website. In the evening I had to finish preparations for my presentation at Winkel tomorrow. This weekend the name for this Sunday is Quasimodogeniti "As New born babes." The Gospel lesson is Jn. 20:19-35. I'm preaching on the Epistle I John 5 and the the Three that testify on Earth: The Spirit, the water and the blood. 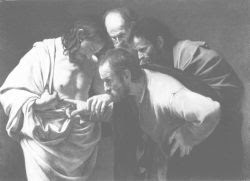 The Gospel lesson brings home the nature of faith and in the closing passages focuses on the testimony of the Spirit through the written witness of the Apostles. The Old Testament Lesson, Job 20 focuses on Job's faith in the resurrection, but the two verses just before the lection also testify to the written testimony of the Holy Spirit. After Church at Mt. Olive there was some other thing that came up. Mary and I watched Galaxyquest. She'd never seen it, and I quote from it so often. She "made me" watch Sense and Sensibility with her previously (actually, I enjoy the movie quite a bit). Alan Rickman is in both movies (as well as playing "Snape" in Harry Potter). I think she enjoyed his character in Galaxyquest. 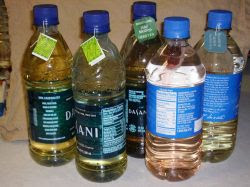 What to do with used water bottles? Rinse them out (occasionally with a little bleach or campden tablets), fill them with water and put in a teabag. Let them sit overnight in the fridge and BANG! Ice tea! Do remember to steralize them fairly often. Especially if they sit in a hot car. This was written Monday the 16th, backdated to keep the sequence. Tuesday (4/10) two trips to TR, both hospital trips. The morning one took a long time. Rod B. had surgery this morning. Possible cancer. The surgery took a long time. Most of the family was there. The surgery was successfull. We'll wait for a pathology report. Now he has to recover from surgery. Please keep him in your prayers. I stopped back later to check on him when he was coherent. Wednesday (4/11) sermon prep and Wed. School. Thursday (4/12) more hospital calls. Sorry, can't release much info. I checked in on Rod. He's having some difficulties but the dr. says they're not unusual. Shirley V. had surgery in Fargo on Monday, today she was tranferred to Fosston. She had back surgery. Her sister called me tonight to let me know about the transfer. Friday (4/12) more hospital calls. Went to Fosston to see Shirley and get some photos developed. Shirley's doing well, but she needs therapy to retrain her back muscles. I finished up the bulletin this evening. Betty is home now. She didn't have pneumonia, he was suffering from congestive heart failure. She's still in delicate condition. Please also keep Shirley and Betty in your prayers. Today I took the family to Bemidji (pronounced locally as ber-mi'-ji). We went the the Headwaters Science Museum, Heartland Foods (for gluten free food ordering), and to the movie "Meet the Robinsons." 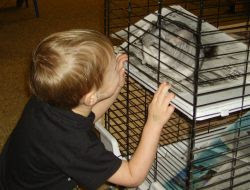 Johnny tried to kiss the chinchilla. He at least got nose to nose with it. Clara kept asking if she could get one of the large snakes out of it's tank. The kids like the science museum quite a bit. Here Louisa, Elsie, and I are seeing what it would be like if we were Hobbits. I think we all had a good time. On the way back we stopped in Bagley to see Betty. She did look a bit better this evening. She certainly sounded better. But she still has a ways to go yet before she's healthy. Betty has had 9 heart attacks since 1982. She's diabetic and has had open heart surgery at least once. A few years back she had to have surgery while I was here. She is a tough lady. Please keep her in your prayers. Got home after 9pm. Need to go to TR tomorrow for another hospital call. Again, I'm late posting. And I'll add a couple of photos later on to this post. It was my privilege to celebrate the Resurrection with 3 festival services this morning. Visitors and family members who have moved away from home attended each service. After leaving home at 7am I got home at 1pm or so. Mary had a wonderful turkey dinner prepared. 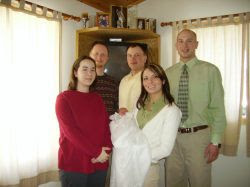 Then, at 3 I was at Quinten and Alyssa's to baptize baby Ashlyn. They had just finished up their Easter feast. So many of Ashlyn's family were able to be there. What a wonderful day to be baptized into the death and resurrection of our Lord and Savior, Jesus Christ. When I got home Mary and the kids were finishing up decorating eggs. They didn't leave me one to decorate...boo hoo, boo hoo. Then came the egg hunt. 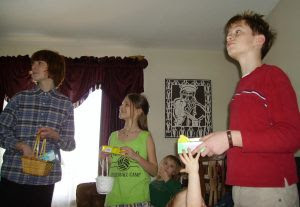 For each kid we put out a basket, a box of peeps, and the eggs they had decorated earlier. Matt had a hard time finding his basket. I told the kids to look up. So you see them looking up. But look directly above Louisa's head on top of the valence at the right end. He found the basket soon after the clue. Here is the look of a little girl who ate all her chocolate eggs. She's doing a bit better getting the flavor on the taste buds now. It's my theory that toddlers do not lack feeding coordination, rather, they have some kind of (as of yet) undetected taste buds in their hair, on their face, in their ears, and even on their clothing. Stella seems to be growing out of that phase of development. Stella tried to stuff a whole peep in her mouth, marshmallow ecstasy! But counter productive to actual breathing. So Elsie helped her out with small portions. As for Parish news: Shirley V. is going down to Fargo for back surgery tomorrow. Betty is still in Bagley at the Hospital, she is still not responding well to meds for her pneumonia. Please keep them in your prayers. Holy Week ended up way too busy for me to post anything, so I'll try to reconstruct what happened. As some of you know, we had a good storm the weekend of Palm Sunday/ Confirmation. 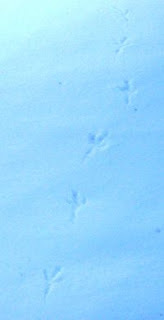 Tuesday morning there were these tracks outside my office door. Tuesday (April 3) one of my members was to have had surgery, this had to be postponed for a week. That member is facing some serious medical issues. I can't release any names right now. Another of my members was in a different hospital undergoing preparatory test for her own surgery. Again, no names at this time. And the parish secretary was in the hospital being induced. She and her husband hoped to have their baby today. But the induction didn't take. It's kind of ironic, not for Alyssa and Quinten, but just the fact that we can plan out some thing with our human wisdom and still the Lord will have things in His own time. Pr. Stafford visited Betty today, she was not doing well. Please keep all of these in your prayers. Wednesday (4/4) sermon prep, service prep, phone calls. I'll be gone most of Thursday for Lyle Manthe's funeral, so I won't have any other time for any prep for Thurs evening or Friday services. I didn't schedule Wed. School for today, and am I ever glad of it. I got the sermons for Maundy Thursday, Good Friday, and most of the Easter sermon done. The girls wanted me to reconsider whether we should go to Rainbow Resort after Easter this year. I've said "No" to that question. Too much work to for such a trip just to relax. 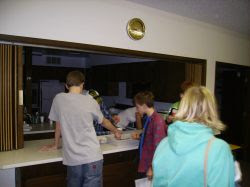 They put together food lists and packing lists and promised to do all the work. They are wonderful young ladies, but such a trip this year just wouldn't work out. Our first couple of years up here a trip to Rainbow Resort after Easter was our family unwinding period after Lent/Easter. But there are some complications this year that won't allow it. Thursday (4/5) I picked up Pr. Stafford at 9am. The funeral was at 10:30 in Ulen. I've known Lyle Manthe since the summer of 1986. Pr. Dale had a wonderful sermon for Lyle's funeral. I got Pr. Stafford home around 2:30, I think. Then I was off to Bagley to see Betty. She is in rough shape. Her medications don't appear to be working and her diabetes is complicating the treatment for her pneumonia. Please keep her in your prayers. I got home about 3:50, Mary got home with the kids from piano lessons about 4:00. I was off to Maundy Thursday services at Mt. Olive. Services were at 5pm. The organist was ill, so I played my recorder for the hymns this evening. After service I was off to Nazareth for 7pm Maundy Thursday services. Got home around 8:30 and worked on memorizing the Good Friday sermon for tomorrow morning. Good Friday (4/6) 8am service at St. Petri in Grygla. It's really cold up here this past week. Today it was 10 degrees F. And as I was driving to St. Petri I heard that the UN has released their report on the evidence for Global Warming. Fine, whatever, I'm still keeping my longjohns on. I got home and Mary told me Alyssa had her baby. So I drove off to TR to see them in the Hospital. Ashlyn Signe weighed in at 5 pounds 7 ounces. Her head is about as big as a baseball. She is extremely aware, keeps her eyes open and can follow movement with her eyes. Beautiful little girl. 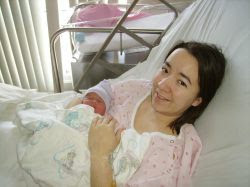 Aly had to have a C-Section. Please keep them both in your prayers and Congratulations to you and Quinten! Mary and some of the kids were a bit under the weather today, so they weren't able to come to the Good Friday service at Oak Park this evening. Very well attended service. Afterward I worked on finishing the bulletin and memorizing for tomorrow morning's service. Saturday (4/7) we celebrated Easter on Holy Saturday at Mt. Olive. Unfortunately I got the chills and spiked a fever during the service. I had to postpone some pre-marital counselling, adult instruction, and a confirmation class. Mary made me take my vitamins, go to bed and sleep during the day. I love her, she is such a good person. Alyssa's mom and sister are up for the weekend. 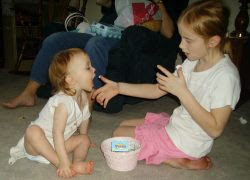 Easter for their family is at Aly's place. Her family is taking care of the preparations. 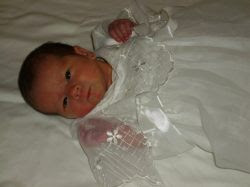 They'd hoped that with the induction on Tuesday that she'd have enough time to recuperate for a baptism tomorrow. But those things didn't work out. I won't be able to go to the hospital today for a baptism. We'll see about tomorrow. I tried to spend most of today with my family. I think I have the top limb of my bow pretty much done. I need to tiller the bottom limb a bit more. I don't think I'll get 50 pounds out of it. Hopefully, I'll get 40 or more. The bottom limb has almost no knots, so it is actually much more able to take higher strain than the top limb. But the several knots in the top limb will limit what I can do with the bow. Here it is strung with the home-made string. I could shoot it now, but the limbs are uneven enough that it would shoot funny. Lonny called today, his mom, Betty, is in the hospital again. She has a bad case of pneumonia. This evening Matt and I went to the Bagley Hospital to visit her. She's in very rough shape. We had devotion and communion. Pr. Stafford will check on her in the morning. By the way. Pr. Stafford is doning fine after his car accident. On Thursday I hope to go with him to Lyle Manthe's funeral in Ulen. Lyle was a wonderful man and a good servant of Christ in the church. Many knew him well. He died of a heart attack early this week. The funeral is at Calvary in Ulen at 10:30am on Thursday. There is a bunch of other Parish news. Quentin and Alyssa are probably going to have their baby this week. That's the good news. Bad news, we have one member going in for heart problems Tuesday in Fargo, she may have to have emergency surgery. They detected a serious blockage during a stress-test and want to treat it immediately. Another member just found out he has cancer and was scheduled for surgery this week. At home, where I grew up, our good friend and neighbor to my folks, Gary, also has been diagnosed with a growth that needs surgery very soon. And my grandpa, who visited this weekend, has started to experience problems which are consistent with cancer. So, any prayers for any of these would be deeply appreciated. Cinderella: the Play on Sunday Evening. 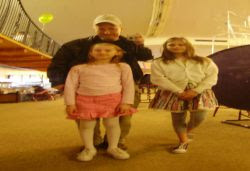 Louisa worked with the rest of the girls to put on a play for her Grandparents and Great-Grandparents. It really was quite a fun show. They all know the Grimm's Fairy Tales version of the story as well as Walt Disney's. But they didn't chop off anybody's toes during the play. I did find these photos quite telling. 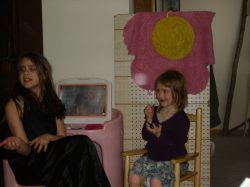 Louisa is the evil step-mother and Sophie is one of the bad sisters (Drusilla, I think). Anyway, they are getting ready for the ball and Sophie is putting on make-up so she can attend the ball. 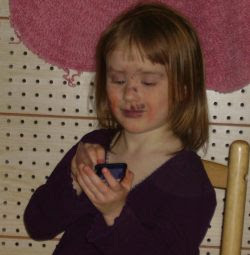 Here's a close up of the way she put the make-up on. We were splitting our sides laughing. Not just at this, but at so many of the things the girls did with this story. Not only did they enjoy the story, but they understood several of the basic lessons and sub-texts of the story that make it a classic. Drusilla is ugly. Everything she does is gaudy and ugly. She is so self-centered that she can't help but be over-the-top in what she does. And Sophie captures that so well just with the simple application of make-up in such a garrish way. And the Ball! Clara was Anastasia. She and Sophie tried so hard to dominate the scene at the ball. We had to stop them several times so we could catch our breath from laughter. was pretty busy with both office work, getting ready for the week end. Alyssa came to do the bulletin. I had her prepare the shut-in newsletters for mailing. But we'll need to get postage for them. At home we spent some time polishing and finishing up getting ready for our house guests. Mary's mother and uncle couldn't make it. They got as far as Billings, MT and were halted by winter weather. They tried to wait it out but ended up deciding to go down to continue on the second part of their trip to Mary's sister in Oklahoma. We're sad that Joan and Ramon couldn't come. But we understand very well the temperament of winter weather. Later we found out that Mary's father, John, had to be hospitalized. He was still home in Wenatchee. He was hoping to be able to fly down to Aimee's in Oklahoma for a visit. Please keep him in your prayers. His health is delicate. I always enjoy visiting with him. He was in the Navy during the Viet Nam War. His memories are always worth a close listen. I ended up working rather late getting ready for the weekend. My folks and the last of my living Grandparents are coming tomorrow. we had worship at Mt. Olive with Confirmation class. Tasha is doing very well now and seems to have rededicated herself to excelling in learning God's Word. I pray that this continues not only to her Confirmation but throughout her life. In the afternoon I took Jeremy and most of the rest of the kids to TR so that Jeremy could get a haircut. When you see his confirmation photos you will realize how much he needed one. The rest of us did some shopping while the barber did the chopping. We stopped back to check on him from time to time. These were the directions I left: cut 2 inches off everywhere and taper the bottom 1 to 1 and 1/2 inches. When we came back there was a heap of hair on the floor, but Jeremy hardly looked any different. Unfortunately, Jeremy's bangs were still in his eyes. Is it ok for a father to say that he really likes his son's hair? I think it's kind of weird to say so, but the simple stupid fact is that I do like it. Ok, my parish members who read this may have different, and maybe even adverse, reactions to this. But cut me some slack, please? We got home late in the afternoon with the supplies for the weekend and a freshly shorn Jeremy. And Grandpa and Grandma and Great-Grandpa and Great-Grandma were there. Oh the hubbub that followed. Louisa has been working with the rest of her sisters on a play to wow them this weekend. But we put it off this evening. I had another confirmation class with a home visit this evening. I had to finish doing some things at the office for tomorrow. I got in the office after 10pm and got home fairly late. See the mop of hair? I think that Jeremy likes it long because mine is short. Whatever. We had worship at St. Petri, then at Nazareth, then at Oak Park. Confirmation was at Oak Park. I like that we have this photo behind the baptismal font with the wooden cross on the top, and then the stained glass window behind us portrays the Lord's Supper. 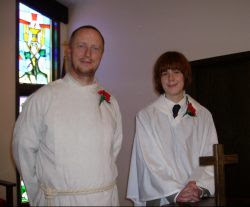 This was also Jeremy's first Communion service. The usher had to remind him that he could go up now if he desired to. Here we have the clan. 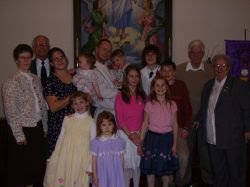 Mom, Dad, Mary, Sophie, Clara, Me, Elsie, John, Louisa, Elsie, Matthew, Grandpa and Grandma. Clara and Sophie are in the front. After the service the Ladies' Aid put on a great meal. Annette and some others went to extremes to feed the four of us who suffer from celiac disease. I brought along some beef chorizzo that was cooked with shrimp, yum. But I find that my taste for this is a bit outside the norm for this region of Minnesota. We thank everyone who came to celebrate with us. May God bless our son with such friends through his life, friends who value the Word and Sacrament of God and view these gifts of God as something worth celebrating. After we got home it was really, really hard to listen to each other's conversation. Often we interrupted each other with snores. All our blood was rushing to our stomachs. Joan called to wish Jeremy well as did Char and Dave and some others.